Jhansi, April 18, 2018: The Ministry of Drinking Water and Sanitation (MDWS), with support from the Ministry of Skill Development and Entrepreneurship (MSDE) and the National Skill Development Corporation (NSDC) organized a training camp for approximately 1000 masons in Jhansi, Uttar Pradesh for the construction of twin pit toilets. In what is expected to be an intense drive towards making India Open Defecation Free (ODF) by October 2019, this is the first such training camp to be launched in Uttar Pradesh, under this partnership between Ministries. While starting with the training of a 1000 masons from Jhansi and the surrounding areas, more such training sessions will take place in the coming months. The skilling of approximately 50,000 masons will be coordinated by NSDC and their training partners. Depending on the skill levels of the masons, they will undergo the Recognition of Prior Learning (RPL) which is a seven-day training program designed to recognise and certify the informal learning and on the job skills that the candidate may have picked up and giving it equal acceptance as the formal NSQF levels. 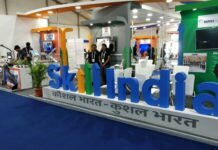 Additionally, training will also be provided under the flagship Pradhan Mantri Kaushal Vikas Yojna’s (PMKVY) Short Term Training program (STT) which lasts 45 days. With nearly 55 per cent successful placements, the Short-Term Training Program (STT) under PMKVY (2016-20) is an effective, refined and demand-driven endeavour, focused on the quality of training. Up until now the widely favoured method of constructing toilets in Uttar Pradesh has been to construct large, sealed septic tanks to collect waste matter which tend to be prohibitively expensive particularly for the rural population, costing anywhere from 20,000 to 70,000 rupees. On reccommendation from the Government and the training partners, the masons receiving the skill training are being taught to construct a much smaller and cheaper twin pit system. This method involves the construction of two leach pits, with a ‘Y’ junction, so that one pit can be filled at a time. The practice being to fill one pit, which may take the average family five to eight years, cover it over when nearly full, and to leave it to stand while the second pit is used. After about a year, once the contents of the first pit have turned into harmless and valuable fertiliserit can be used and sold by the family. “Our work, where we are supporting national missions such as these through association with their respective ministries is a clear example of One India Team vision of our Hon’ble Prime Minister. We are certain that our joint efforts will result into a wide positive impact in the society and will bring about behavioural change in our people where they are sensitized about sanitation and well-being,” he further added. In less than two years of its launch, PradhanMantriKaushalVikasYojana (PMKVY) (2016-20), the flagship scheme of the Ministry of Skill Development & Entrepreneurship (MSDE)hasmade rapid progress. The scheme has achieved a landmark milestone of 4,76,592 placements (as on April 18th, 2018).